At Five Lions Heating & Cooling we repair all makes and models boilers, Our team of experts are highly trained and knowledgeable about all type of hydronic heating systems. The boiler is a part of our home that we all rely on. It is responsible for the heating and hot water systems in your home or business. Boiler repairs and maintenance work should never be carried out by anyone who is not qualified. At Five Lions Heating & Cooling you can rest assured that your boiler problems will be fixed by our company with the necessary expertise. A broken boiler can cause disruption in the home. 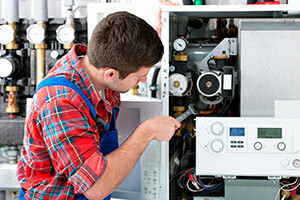 Keeping your boiler in good condition by having it serviced regularly is the best option. You can also improve your boiler’s lifespan by limiting how you use it. Putting unnecessary strain on your boiler could increase the risk of breakdown in the future. We stress that it’s essential that you don’t attempt to carry out work on the boiler yourself. Contact a professional to repair or replace your boiler system. Trying to repair and replace your own boiler system can be very dangerous and will invalidate any insurance policy. Instead, call a Five Lions technician to avoid this hassle. All of our technicians are fully qualified and Gas Safe registered. You can be confident that the service they are providing is of the highest standard. The best way to avoid trouble with your boiler in the future is to have it regularly serviced by a professional. Services will not only ensure that your boiler is in good working order, but can also maximize efficiency and saving you money on future energy bills. Speak to our professionals today about a full boiler repair or replacement, and take the opportunity to have any work done which might be needed. Whether you’re an existing customer or not, we offer a variety of boiler repair and maintenance services, helping you to keep your boiler in top condition – whatever the situation may be. Contact Five Lions Heating & cooling professionals for help and advice today and repair your boiler system.